United Arab Emirates macro economy has achieved new heights despite ongoing regional political uncertainty and global economic recession. UAE prudent policies of economic liberalization, diversification and export orientation has maintained elements of stability and sustainability since its inception 1971. Now it is one of most knowledge-based economy in the world. It revolutionized source of income and production channels which made it the 2nd largest economy in the region. According to official figures, the consistency in the macro economy policies uplifted its GDP from AED6.5 billion in 1971 to over AED1 trillion in 2010, increase up by 150 folds. Per capita was surged from AED100, 000 in 1975 to AED132, 000 in 2010, a remarkable achievement. On the other hand, the inflation percentage drastically dropped by 8 per cent in 1979 to 0.88 per cent in 2010. Now Central Bank of UAE said that UAE economy grew by 3.5 to 4.2 per cent in 2011 compared to 1.3 per cent in 2010. It estimates that GDP may reach to 4.5 percent during 2012. Moreover, due to its rigorous diversification policy, the non-oil sector grew in the same period by 3.1 per cent. Most recently, Foreign Trade Minister Sheikha Lubna Al Qasimi said that the UAE foreign trade would see growth by 10- 15 per cent in 2012. Now UAE foreign trade policy focuses on expansion of non-oil sector with different countries worldwide, and boosting ties with its trade partners in five continents. Sheikha Lubna said the growth rate of UAE foreign trade in 2011 was 23 per cent against 14 per cent in 2010, surging by AED47 billion. She further said the UAE had managed to overcome the effects of the world financial crisis. 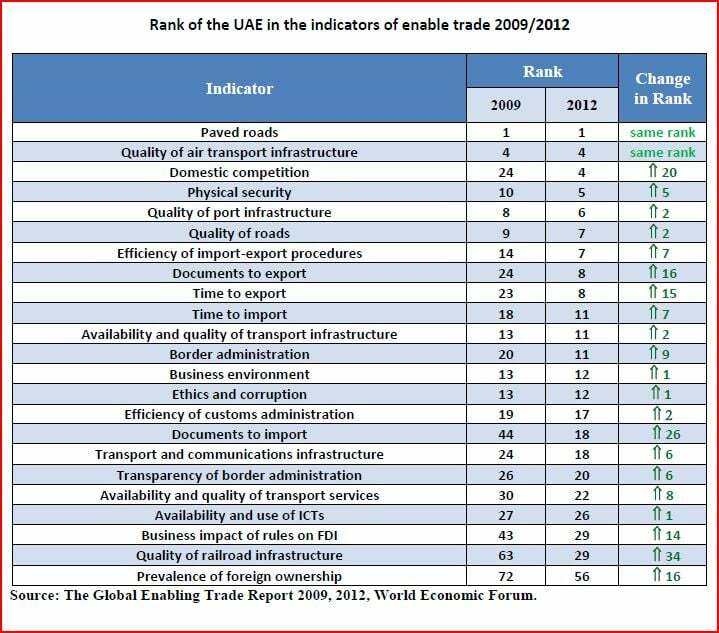 According to latest published report of the World Trade Organisation (December, 2011-2012), the UAE has been classified as the world’s 20th biggest exporter in merchandise trade surpassing countries such as Australia, Brazil, Switzerland and Sweden. 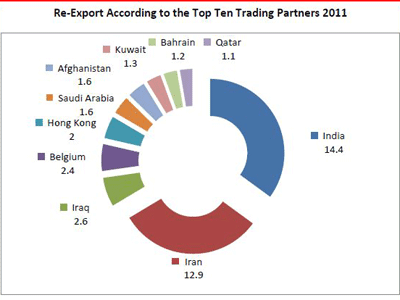 It showed the UAE exported US$285 billion (Dh1 trillion) in merchandise trade, next to India. Nevertheless, the UAE constituted 1.6 per cent of the world’s exports which stood at US$18.215 trillion of merchandise trade in 2011. On the other hand, the UAE is the world’s 25th importer in merchandise trade, having imported merchandise worth US$205 billion in 2011 which represent 1.1 per cent of the world’s imports of US$18.38 trillion according to WTO report. 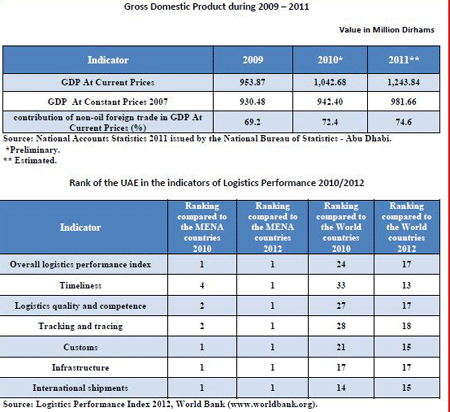 According to latest report of the National Bureau of Statistics (December, 2012), the total value of UAE’s foreign trade in the first half of 2012 touched Dh499 billion as the national exports amounted to Dh77 billion in the same period it is because of the consistent economic policies, stability and business friendly laws of the country. Due to which now, the UAE has become one the ideal destinations of productive business and service sector. Moreover, it has been labeled as a gateway for several markets worldwide. According to recently published official figures the total value of Abu Dhabi’s non-oil merchandise trade in August 2012 was Dh12.035 billion, of which Dh8.764 billion (72.8 per cent of total) was imports, Dh2.189 billion (18.2 per cent of total) was non-oil exports of and Dh1.082 billion (nine per cent of total) was re-exports. The Undersecretary of the Economic Development Department Abu Dhabi has also expected the Abu Dhabi non-oil sector’s contribution to the economy would rise by 64 per cent by 2030, thanks to the development of productive sectors, especially the industry, tourism, telecommunications and transport. In this connection, Abu Dhabi’s Economic Vision 2030 has played a remarkable supportive role in the country. It gives guidelines for further economic diversification and industrialization. The Khalifa Fund for Enterprise Development has also succeeded to create new generation of Emirati entrepreneurs. It is hoped that the strategic Khalifa port in Al Taweelah area in Abu Dhabi and the expansion of Abu Dhabi Airport, being a vital trade hub for East and West would bring desired goals of diversification in the days to come. The monthly report said “total non-oil merchandise trade increased by Dh294 million (2.5 per cent) in August compared with July 2012, with non-oil exports increasing by Dh1.130 billion (100 per cent) while imports retreated by Dh656 million (seven per cent) and re-exports by Dh180 million (14.2 per cent) over the same period of time”. Moreover, the value of non-oil exports increased by over 100 per cent, with increases of Dh642 million (100 per cent) in “Machinery and transport equipment”, Dh266 million (69.7 per cent) in “Chemicals and related products” and Dh192 million (100 per cent) in “Miscellaneous manufactured items”. 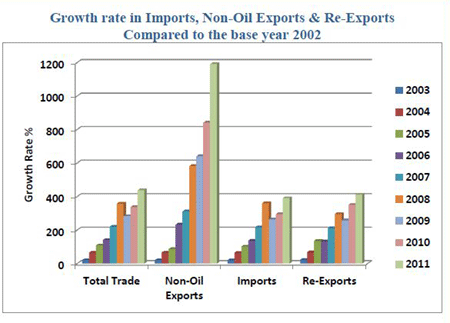 According to the report, a year-on-year comparison of non-oil merchandise trade data (for August 2012 compared with August 2011) indicates a rise of Dh2.011 billion (20.1 per cent) in total trade, with non-oil exports increasing by Dh1.781 billion (100 per cent), and imports decreasing by Dh125 million (1.4 per cent) over the same period, due to decreases of Dh283 million (34.8 per cent) in the “Other commodities” group and Dh96 million (2.2 per cent) in “Machinery and transport equipment”, which were partially offset by increases of Dh155 million (22.9 per cent) in “Chemicals and related products” and Dh72 million (3.6 per cent) in “Manufactured goods classified chiefly by material”. Non-oil exports increased by over 100 per cent, reflecting increases of Dh731 million (100 per cent) in “Machinery and transport equipment”, Dh553 million (100 per cent) in “Chemicals and related products”, Dh227 million (93 per cent) in “Manufactured goods classified chiefly by material” and Dh199 million (100 per cent) in “Miscellaneous manufactured items”. According to data released by the Dubai Statistics Centre (DSC), Dubai’s economy is all set to record the biggest expansion in five years due to strategic expansion in the sectors of tourism and trade. Its GDP increased by 4.1 percent during the January-June period to Dh161.5 billion, compared to 3.4 per cent growth in the same period in 2011. Foreign trade, including re-exports, surged by 11.4 per cent in the first half. It predicts that Dubai’s economy will grow at more than four per cent in 2012,”. Exceptional growth in trade, tourism, logistics, FDI, exports and re-exports have been the bedrock of Dubai’s macro-economy strength due to which it has now become hub of all kinds of trade & commerce activities. The hotel and restaurant industry registered more than 16 per cent growth, while manufacturing expanded 10.4 per cent. Most recently, UAE has been recognised as a leader in corporate governance and transparency drives during the 2nd Annual Chief Audit Executive Conference, organised by UAE Internal Audit Association (UAE-IAA) in Abu Dhabi. Moreover, the net assets reached Dh1.7 trillion by October 31, 2012 compared to Dh1.6 trillion for the same period of last year. The total deposits amounted to Dh1.16 trillion ($316.4 billion)”. “The net lending by end of October 2012 was Dh1.1 trillion ($74.9 billion) while capital funding was Dh274.3 billion ($74.7 billion).” There is no sign of liquidity crunch in the country because the signs for the strengths of the UAE banking sector are many, starting from the assets, to deposits and to lending. He added that the total profits of the banks in the UAE reached at the end of last October AED24, 689 billion. He said the Central Bank of the UAE works to achieve financial stability in the country through the creation of a financial system that is able to address any risks. Now, the Central Bank and the Ministry of Finance are working on three laws to boost the operations of the financial market and the banking sector. One of them is about the general framework of the financial transactions, the second is about the banking sector and the third is about the Securities and Commodities Authority which are hopefully make things more transparent, accountable and profitable in the days to come. The Organisation for Economic Cooperation and Development praised highly about the sustained socio-economic development of the UAE and termed its hope for the world in the days to come. According to the annual Economic Freedom of the Arab World report (November, 2012), UAE and Bahrain, are home to the highest levels of economic freedom among Arab nations. Economic freedom is the key to increasing prosperity, creating jobs, and reducing poverty and attracting more and more inflows of foreign direct investments in the country. It paves the way for more economic liberalization and social prosperity and human dignity and undoubtedly, UAE is the safe haven for investors, businessmen and foreign workers too. Most recently co-published report of World Bank, International Financial Corporation, or IFC, and PricewaterhouseCoopers (PwC), companies in the UAE enjoy the world’s least demanding tax framework. Companies operating in the UAE, which was last year ranked sixth globally for having the easiest tax structure, pay an annual total tax rate of 14.9 per cent make four payments a year. According to the report, the UAE is among those few countries in the world without a personal income tax regime. On average a medium company in the Middle East makes 17.6 payments and pay three major types of taxes including labour taxes, mandatory contributions and consumption taxes), a figure which is well below the world average and the lowest for any region. According to prestigious World Justice Project (November, 2012) titled “Rule of Law Index”, UAE is ranked fifth in the world in terms of order and security. The UAE was ranked number one in the region in half of the eight main categories that contribute to the overall rankings. It further said the UAE ranked number 1 in terms of ‘Absence of Corruption’, ‘Order and Security’, ‘Regulatory Enforcement’ and ‘Criminal Justice’. The report said that the UAE leads the region in several dimensions of the rule of law due to which public institutions in the country are relatively well-developed and free of corruption, and government officers are held accountable for misconduct. “The country is safe from crime and violence (ranking fifth in the world) and the civil court system is efficient and relatively independent. United Arab Emirates has celebrated its 41th National Day on December 2, 2012. Its macro-economy has achieved new heights in all sectors and sub-sectors. Diversification of economy holds the key in the future. Service sector, growth of small and medium enterprises, tourism and re-exports would be backbone of the UAE economy. Knowledge-based economy with high spirits of innovation and use of technologies would make it leaders in renewable energies resources in the future.